Does Apple's iPhone OS 'Game Center' Threaten Nintendo? Is the iPhone a legitimate gaming platform? Ask anyone who's ever fiddled with one for more than a few minutes (anyone that isn't Nintendo, anyway). Ask anyone who understands, correctly, that video games are more than just Modern Warfare 2 and World of Warcraft. And ask anyone who just watched Apple's iPhone OS 4.0 event live earlier today. 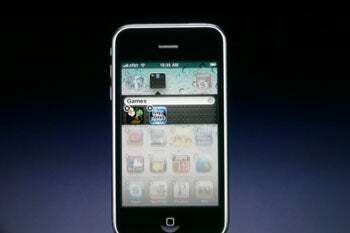 At the event, Apple's Steve Jobs announced something called "Game Center" for the company's upcoming iPhone OS 4.0, and it looks an awful lot like Apple's answer to Microsoft's Xbox LIVE and Sony's PlayStation Network. Imagine an online video games hub that fits in your pocket and follows you anywhere--not an emasculated subset of some other app (like iPhone versions of Xbox LIVE) but one native to the iPhone platform itself, integrated with the device's massive games library. Leaderboards, achievements, automatic matchmaking, friend invites, the whole caboodle. Now imagine that bolstered by over 50,000 games courtesy Apple's App Store, dramatically more than you'll probably ever find on the Nintendo DS or Sony PSP. Another arrow in Apple's gaming quiver? Don't tell Nintendo. Earlier today, Nintendo president Reggie Fils-Aime brushed off the iPhone OS as a "viable profit platform for game development," adding that "[Apple] is not having an impact on Nintendo" and citing data that suggests iPhone gamers downloads apps, play them briefly, then move on to other things. Fils-Aime is missing the point (and he's flat wrong that iPhone games 'aren't even a mouthful' when contrasted with DS games--Civilization Revolution, Final Fantasy, or SimCity anyone?). Even if it's true that iPhone gamers flit between games or don't engage in the same way kids playing Pokemon Gold or Silver on the DS do, people are still sucking down App Store apps en masse, and those apps are only getting more sophisticated. Like Nintendo and so-called "casual" online games hubs like Big Fish and PopCap who cater to millions of players, Apple understands precisely how deep the rabbit hole goes. Laugh at Plants vs. Zombies and Bejeweled buffs all you like--they're laughing back, probably in greater numbers. Add something like Apple's proposed Game Center--a social gaming hub with console-like online gaming features--and supplement with a gamepad-shell to counteract touchscreen deficiencies and to be honest, Nintendo doesn't have a prayer against the looming Apple games juggernaut if it trundles forward with Fils-Aime's myopic attitude.